Jacob, his sons, and their families had gone into Egypt to live because there was a severe famine in their land, and they were able to find food in Egypt. Joseph, Jacob's son, was a ruler in Egypt at that time and the children of Jacob (Israel) were treated kindly. Years passed. Jacob and his sons died as well as everyone of his generation. The people of Israel had many children and had become a great nation. Pharaoh began to fear them. There were so many of them! If a war came, the Israelites might takes sides with the enemy and fight against Pharaoh. He made slaves of the children of Israel. They had to work hard making bricks, building cities, and working in the fields. Pharaoh told the midwives Shiphrah and Puah to kill the baby boys. 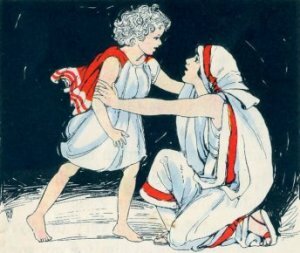 These two women helped the mothers when the babies were born, but they knew it would be wrong to harm the children, so they made excuses and didn't obey the king. So the king commanded all his people, "Every son who is born you shall cast into the river, and every daughter you shall save alive." The Israelite women were so scared. They didn't want their baby boys to be killed. There was a man of the tribe of Levi named Amram. He and his wife Jochebed already had two children, a daughter Miriam and a son Aaron. Then during this terrible time another son was born. He was a beautiful child and they loved him very much. They hid him for three months. Jochebed wanted him to be in a safe place. Their home was not a safe place for him. 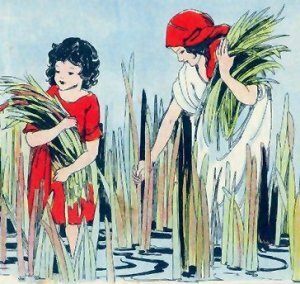 In those days people would gather bulrushes, marsh grasses with long stems, to make baskets. 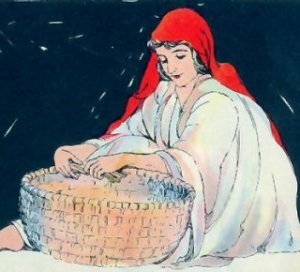 A basket made of grass would not keep the water out, so Jochebed used asphalt and pitch, sticky waterproof substances, to make the ark (basket) waterproof. She put the baby in the basket and placed it in the water among the reeds growing by the edge of the river. Miriam watched him to see what would happen. 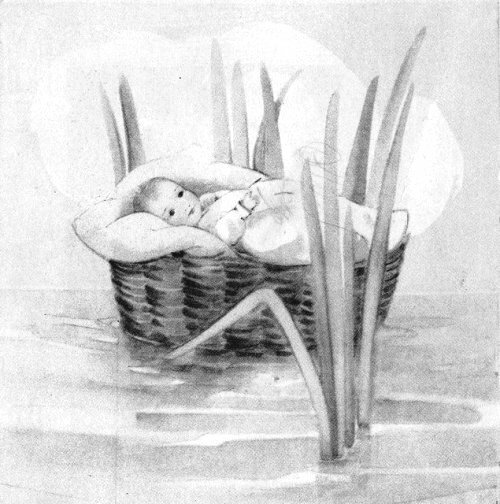 The basket bobbed in the water and floated until it came to the place where Pharaoh's daughter was bathing. She saw the ark among the reeds and sent a servant to get it. It had a cover on it, and when she opened it the baby began to cry. She said, "This is one of the Hebrews' children." Her heart was tender and she didn't want the baby boy to be killed. About that time his big sister Miriam came out of hiding. She offered to get a nurse for the child. You know, of course, who the nurse was going to be. The baby's own mother! Pharaoh's daughter named him "Moses", a word meaning "drawn out" because she had drawn him out of the water. His mother raised him until he was big enough to go and live in the palace. During that time his family taught him about his people and told him the stories of the Israelite family. 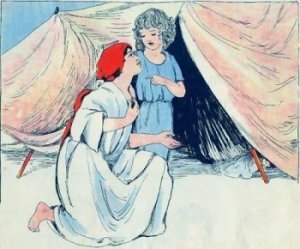 Then he went back to the princess, became her son and lived as a prince of Egypt in the palace until he was a grown man. Jochebed was used by God to save her baby boy. God had a very important job for Moses to do when he grew up. He would be the one to save his people and lead them out of slavery in Egypt. Jochebed trusted in God to help the family through the difficult times they were enduring. God listened and answered her prayer for protection for her son. He gives what is best. Sometimes the answer may not be the answer we wanted. English Bible Activities Select story #35 in the list for activities to accompany this Bible story. Spanish Bible Activities Select story #35 in the list for activities to accompany this Bible story. Press "Go" to search for books about Baby Moses. its a very nice resource room most especially for me as a teacher who is a student.. its very convenient to use.. it does not make you dizzy to look for a lesson..in here you can find it all but may i request that can you add activities for the kids not only the coloring pages.. thank how about crafts.. This page displayed 74,509 times.